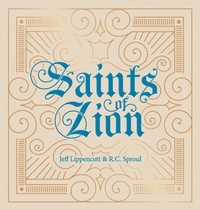 Save more when you purchase five or ten copies of Saints of Zion. In this new collection of sacred music for the church, Jeff Lippencott and R.C. Sproul provide hymns to enrich the worship of the people of God and bring glory to our Creator. Drawn from years of theological reflection and application, these songs offer biblical truth through beautiful choral and orchestral arrangements. Suitable for congregational singing as well as private devotion, these hymns are meant to encourage and equip the saints of God for greater and fuller worship.